One shot was fired in an officer-involved shooting early Saturday, according to a news release from Juneau Police Department. Juneau Police say Sgt. Chris Gifford fired the shot that injured Juneau resident Jeremie Shaun Tinney, 38, during an incident in which officers were investigating a single-vehicle crash in the 16500 block of Ocean View Drive. Darin Schultz was the other officer involved in the incident. Police Chief Bryce Johnson said at a news conference Saturday that the man who was shot, now identified as Tinney, did not follow officers’ orders and one of the officers felt he had to shoot him. Johnson said police did not find a weapon at the scene. Tinney was transported to Bartlett Regional Hospital and then medevaced to Seattle, where he was treated for non-life-threatening injuries at Harborview Medical Center. Tinney was released from Harborview on Sunday. He was then arrested by a Washington agency on an outstanding Washington state arrest warrant. The warrant was for charges of third-degree assault on a child, fourth-degree assault, harassment and a probation violation. Lt. David Campbell said Monday that police did not know Tinney had a warrant in Washington at the time of the incident. Gifford and Schultz were placed on administrative leave, as per department policy. Gifford has worked for Juneau Police Department for 16 years. Schultz has been on the force for 19 years. Alaska State Troopers Bureau of Investigation is assisting with the case. “Our goal is to conduct a very thorough, very professional, very transparent investigation so we can give very clear answers for what occurred and why what occurred happened,” Johnson said at the news conference. Police will be using the officers’ vehicle dash cam video and audio recordings to help piece together what happened. Citizens of Ocean View Drive, an isolated neighborhood on the outskirts of Juneau, woke to gunfire early Saturday morning when Juneau police shot a man they said didn’t comply with an officer’s instructions. The man is expected to survive. According to the Juneau Police Department, this was Juneau’s first officer-involved shooting in almost 10 years. 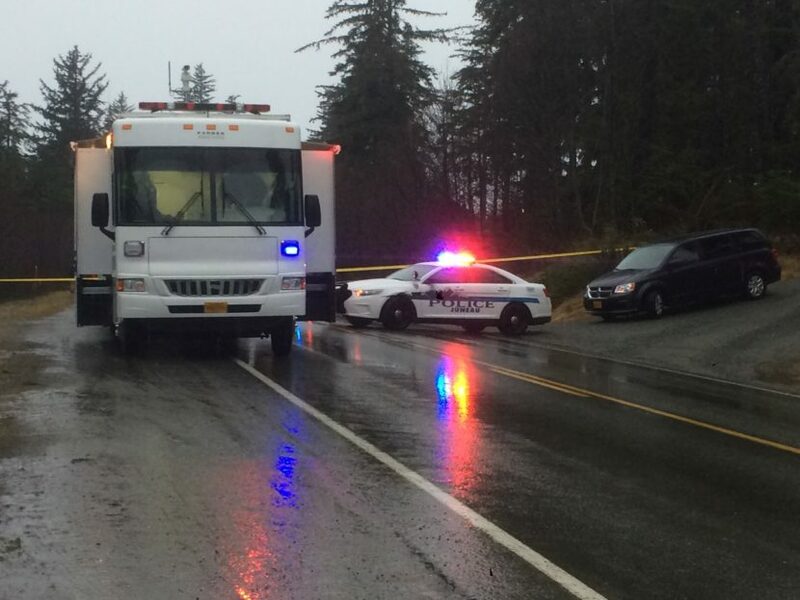 Juneau Police Department said that a 38-year-old Juneau resident was shot by police after he and another man crashed into a ditch in the 16500 block of Ocean View Drive. The two men haven’t been identified. 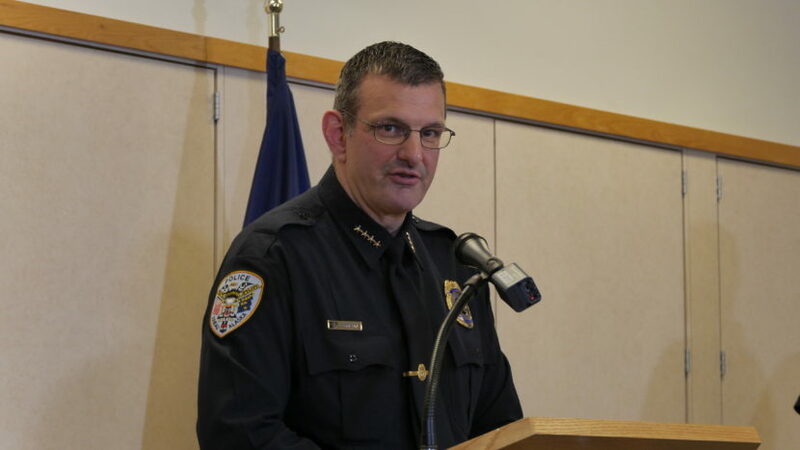 Juneau Police Chief Bryce Johnson said at a press conference Saturday that the man who was shot did not follow officers’ orders and one of the officers felt he had to shoot him. Johnson said police did not find a weapon at the scene. He said the two officers involved in the shooting are on administrative leave while their actions are investigated. Per department policy, he said their names won’t be released until December 5, at the earliest. Johnson said James Scott, the Juneau District Attorney, will also have access to the scene. Scott said he will be joining the investigation alongside the state Department of Law’s Office of Special Prosecutions, and the Alaska Bureau of Investigation as part of a new protocol for officer-involved shootings statewide. 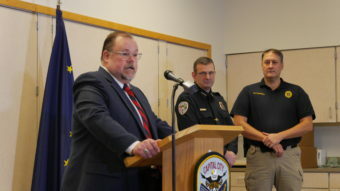 “Unfortunately it’s a practice that the Office of Special Prosecutions has had an opportunity to develop with regard to officer-involved shootings in Fairbanks and Anchorage,” Scott said. Johnson said he doesn’t know when the investigation will end. He estimated it could take several weeks – depending on the information it uncovers. “Our goal is to conduct a very thorough, very professional, very transparent investigation so we can give very clear answers for what occurred and why what occurred happened,” Johnson said. No charges have been filed against the man who was shot. Johnson said he has had run-ins with police before and he said in the past, the victim has made threats to harm police officers.